I am walking down the hill to work on recycling day. Medellin’s army of recyclers strips our rubbish of anything of value like a horde of human locusts. At one point, the rubbish has spread over the pavement and I step off on to the road to pass by. In a flash, one of the men picks up the rubbish and gestures with a courtly flourish for me to continue on the pavement. A gentleman with a dirty face. Here, God has not been pushed to the margins of public life. There is a talent show for children on TV just now, called Factor XS (the S stands for Small). A child is asked if he think he will advance to the next round. “It’s in God’s hands,” he answers simply. I spoke to a friend on the Coast last week. I know she has a little plot of land that she is cultivating, so I asked how it was going. She told me that two planes had passed over recently, fumigating and destroying the illicit fields of coca in the area, but not, of course, distinguishing between coca and legitimately sown rice and yuca. This is what the war on drugs looks like on the ground. but it was just a recorded message in support of a candidate in the upcoming elections. At least, I hope so, because I hung up almost immediately. 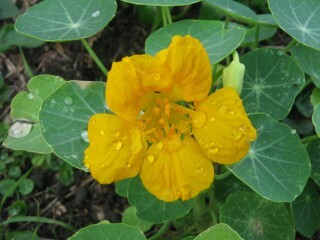 The nasturtiums have flowered! Great excitement all round. A report published last week by COHDES, the Consultancy on Human Rights and Displacement, showed that almost 90,000 people – 17,950 families, had been displaced in Colombia in the first six months of 2011. COHDES found no significant difference between the last year of ex-President Uribe’s rule, and the first of President Santos’. Last week, I caught a few minutes of the Colombian President’s address to the General Assembly of the United Nations. One year ago, I said that Colombia found itself – as a result of security, economic, and social progress – at a new dawn. Today I can tell you, with realism based on optimism, that the first rays of that dawn have already started providing us with their warmth and light. How I want to believe him. 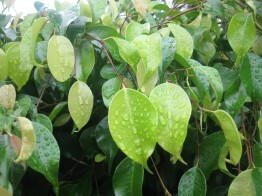 It starts to rain but very, very, lightly. by hundreds of invisible hands. Another political slogan with with word change in it catches my eye. He is backed by former President Álvaro Uribe, but the way the light shines on the poster I read his name as President Bribe. I am in a taxi with 4 other women (it’s a squash). “I knew it,” he says, pleased with his acuity. It’s true. I was born in Peru but haven’t lived there for decades. But still, I like my dual identity and I like it being identified.